After losing more than half of his stack to Ralph Massey, Ralph Macri got the rest of his chips in on a [7h][2s][7d] flop holding [5h][5d]. Unfortunately for him, his pair was no good as Matt Wantman held [Ah][Ac]. It was a close call when the turn fell [6c], and another close call when the river fell [4s]. But neither was a five to keep Ralph in the tournament, and he will exit in 10th place. Ralph will collect $4,699 for his efforts. Ralph Massey was all in preflop holding [As][Kd] against Ralph Macri's [Qs][Qc]. It was a flip for Massey's tournament life, and the [8c][3d][Kh] flop was just what he was looking for. Macri couldn't find a queen on the [4d] turn or [Kc] river, and he will ship over 300,000 to Massey, effectively reversing the Ralph's stacks. 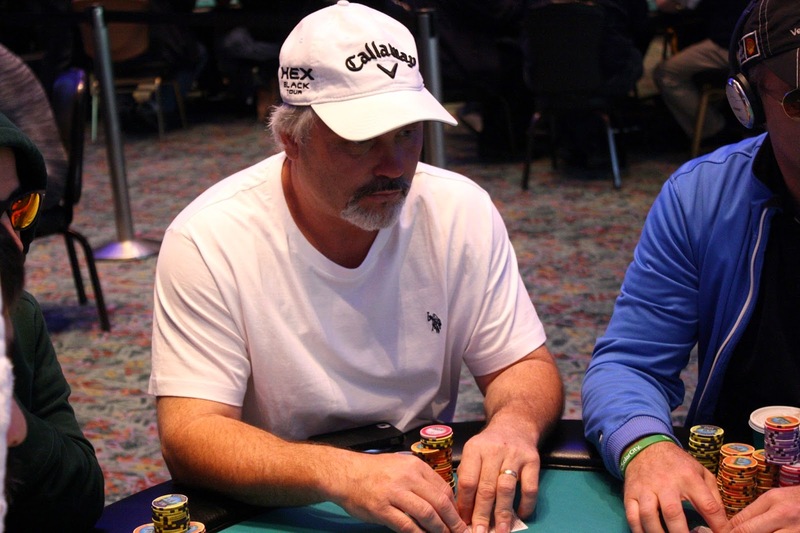 Ken Frey and Marty Gorenc tangled in a pot where they both got their chips in preflop. Ken's [Td][Tc] were behind Marty's [Qh][Qd], and the [5c][3s][8d][4h][As] board changed nothing. The stacks were counted down, and Ken was left with just a few chips. He got the last of his chips in a few hands later with pocket deuces, which were counterfitted by Ralph Macri's queen jack on a double paired board. Ken will exit this tournament in 12th place, good for $4,699. On a [9s][6s][4h][5h] board, Welther Marmol bet 80,000 before Ted Driscoll moved all. Welther made the call, and both players were really close in chips we weren't sure who was all in. Welther had a straight and flush draw with his [Ah][3h] and Ted turned over [As][Td] for ace high, but the best hand. The river landed the [7d] to give Welther a straight, and the stacks were counted down. Welther had Ted slightly covered, so Ted will exit this tournament in 13th place, good for $4,204. At 4,000/8,000 blinds, Todd Rebello was all in from the button for 66,000. 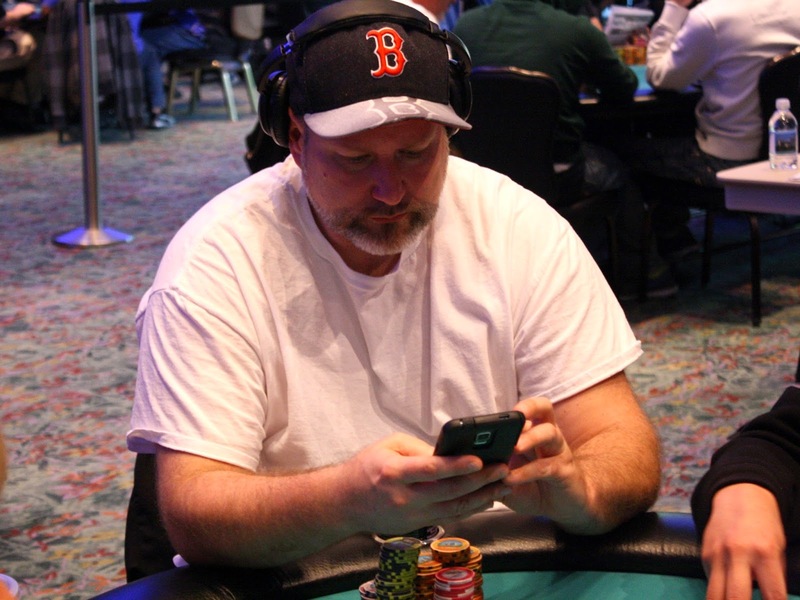 Ted Driscoll made the call from the big blind, and it was a race with Todd's [Js][Td] against Ted's [6h][6c]. It wasn't a race for long as the flop fell [8c][8s][6d], giving Ted a full house. Todd could only winning with running cards, and the [9s] wasn't one of them. The meaningless [2d] hit the river to eliminate Todd in 14th place, good for $4,204. The board read [4d][5c][6h][3h][Ts] and Je Wook Oh bet 69,000, putting Todd Rebello in the tank. Todd thought it over and eventually called, mucking his hand when Je Wook showed him [7d][6d] for a turned straight. Je Wook increased his stack to 550,000 after that hand. Michael Orgettas has been eliminated when his [Kh][Jh] was unable to improve against his opponent's [As][8c]. The board ran out [Ts][7s][3h][Ac][9d], and Michael will head to the rail in 15th place, good for $4,204. Brad St. Vincent has been eliminated when his king ten was unable to improve against Ralph Macri's ace seven. Ralph made a straight by the river to send Brad to the rail in 16th place. He will collect $3,657 for his efforts. 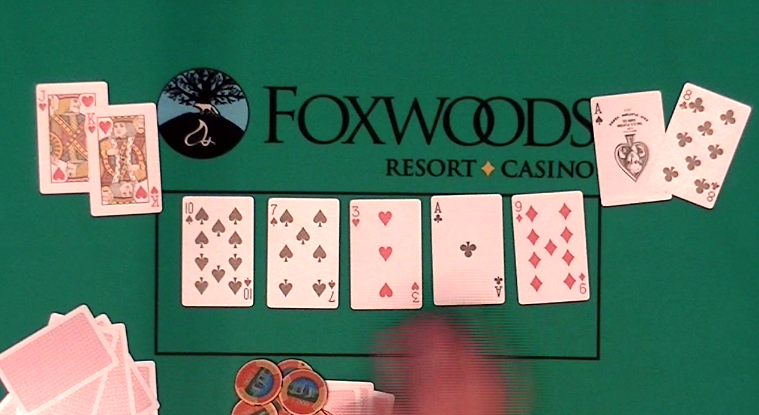 James Campbell has been eliminated when his ace six ran into his opponent's pocket seven. James was unable to improve, and he will be sent to the rail in 17th place. He will collect $3,957 for his efforts. 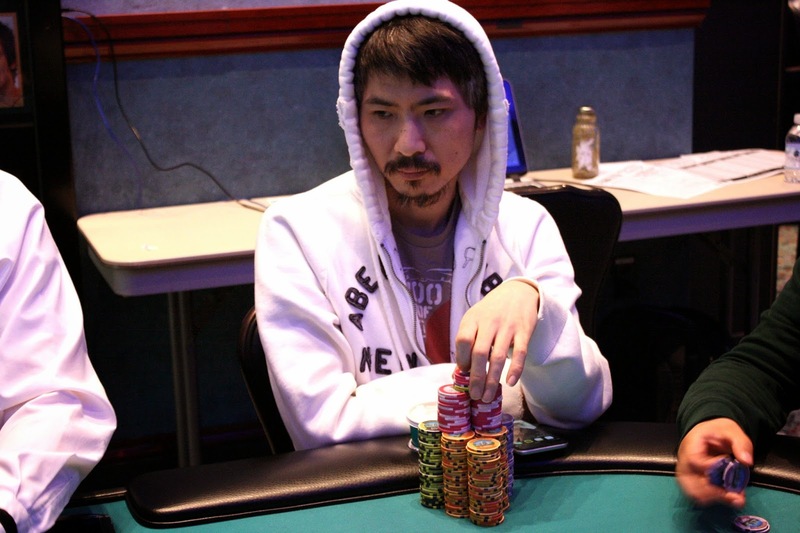 William Dang has been eliminated in 18th place when his ace queen failed to improve against his opponent's pocket eights. He will take home $3,957 for his efforts. Dave Stefanski was effectively all in preflop from early position and action folded around to Ken Frey in the big blind who made the call. It was Dave's [Kh][Jc] against Ken's [Ah][Qc]. The board ran out [7c][9s][6h][3s][3c] to keep Ken's ace high in front, and Dave will the unfortunate Bubble Boy. The remaining 18 players are now in the money, with a guaranteed $3,957 payday. The clock has been paused while the tournament staff redraws the players into the final 2 tables. Play will resume shortly. Because play was hand-for-hand, 10 minutes was added to the clock. The extra time was not enough to burst the bubble, so the 19 remaining players are now on a 1 hour dinner break. When play resumes, blinds will be 3,000/6,000 with a 1,000 ante, and hand-for-hand play will continue. 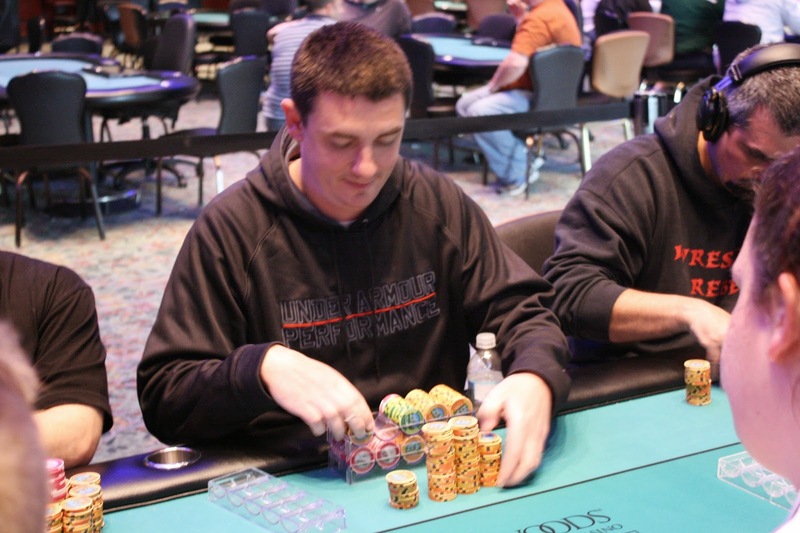 With the elimination of James Frangoulidis in 19th place, Event #10 $1,650 Championship is now hand-for-hand. The next player out will be the Bubble Boy, while the remaining 18 will be guaranteed at least a $3,957 payday. At 2,500/5,000 blinds, Dave Stefanski raised to 12,000 and James Frangoulidis called on the button. Ralph Macri reraised to 37,500 from the small blind and both Dave and James made the call after some thought. The flop fell [Jh][9d][4d] and Ralph moved all in, putting Dave deep into the tank. After a few minutes of thought, he folded, and James right behind him snap-called. Ralph had been outflopped as James had flopped top set with [Js][Jd] against Ralph's [Ad][Ac]. James was the one all in, and he didn't like the [Ah] that hit on the turn. Needing the case jack to survive, the dealer delivered the [Qc] on the river. James will be our 20th place finisher and Ralph will increase his stack to 560,000. A player raised in early position and Matt Wantman called from the button. The big blind came along as well to see a [3d][Qs][Tc] flop. The preflop raiser led for 14,000 and Matt raised to 32,000. Action folded back to the preflop raiser who put in a 3-bet to 75,000, which Matt just called. The turn was a [6d] and Matt's opponent instantly went all in. Matt called just as quick and tabled [Ts][Td]. It was a cooler as his opponent had [3h][3c]. Matt just needed to dodge one out, and when the river came the [6c], a massive stack was pushed over to Matt, who now sits on over 700,000. We missed the hand, but we saw Chris Tryba exiting the tournament area. He has been eliminated in 22nd place, just shy of the money. 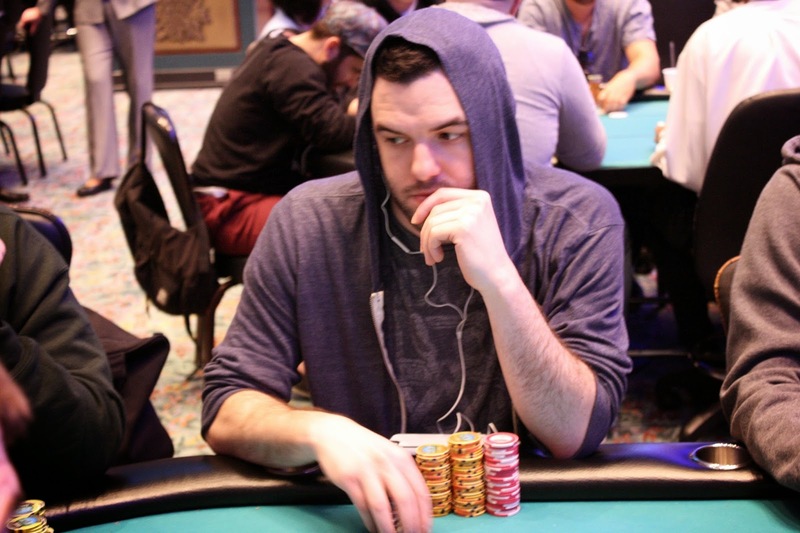 Mike Nye pushed the last of his chips in from the cutoff and was called by the small blind. Mike's [Kc][3c] was live against the small blind's [Ah][4c], but the [7h][6h][9h][5s][Th] board was no help for Mike, who will exit this tournament in 31st place. The field has been trimmed to 36 players, which means we're down to the final four tables. Cards are back in the air for Day 2 of Event #10 $1,650 Championship. All remaining players from yesterday's Flights A & B have combined and will play 10 levels today. You can watch the stream of the featured table at www.FoxwoodsLive.com. A full schedule for the series is available here. With 10 minutes left on the clock, the tournament staff has drawn a card. Three more hands will be played before Flight Bwill be complete for the night. The board reads 21 players remaining. Play has begun in the last level of the night. Blinds are now 600/1,200 with a 200 ante. At the completion of this level all remaining players will bag up their chips for the night and return at 12pm to play Day 2.